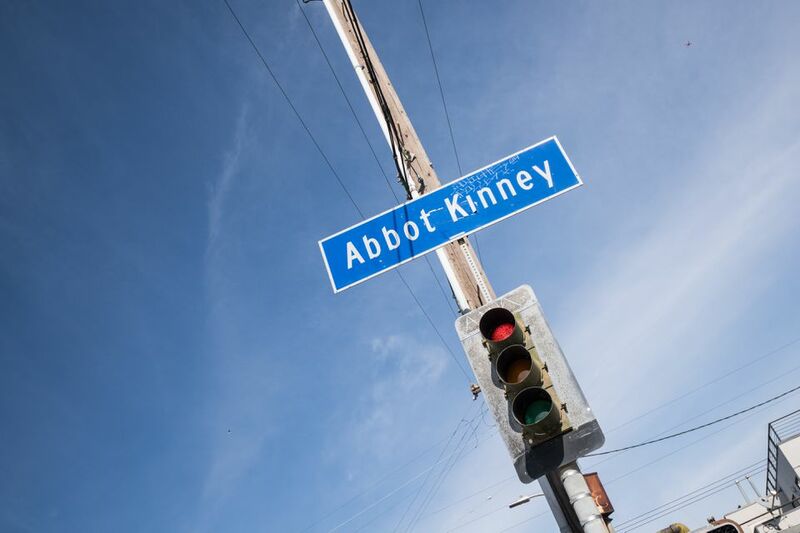 The name Abbot Kinney seems strange. Who or what is it? Mr. Abbot Kinney was an early 20th-century real estate developer who created the city of Venice Beach, which he called the Venice of America. Why should you care about that bit of historical trivia? In 2012, GQ magazine called a section of Abbot Kinney Boulevard “The Coolest Block in America.” In 2016 Forbes magazine said Abbot Kinney is "where hipster meets bohemian. Where LA meets NYC, Portland, and Chicago. Where cool meets urbane." Is Abbot Kinney the street still "cool" today? In 2012, you could buy everything in GQ's 2012 Style Bible there. You can still find all of them now — and more including some stores that opened after marijuana became legal in California. You can still get your eyes checked and get a haircut, too. However, about half of the retail stores GQ said made Abbot Kinney cool have closed or moved. Vintage shops and local makers first gave the area its funky-yet-sophisticated reputation. Now they have mostly given way to businesses from Portland, New York City, San Francisco. People who loved Abbot Kinney when it was up-and-coming now compare it to an overpriced outdoor mall. And if you live in Los Angeles, you can find many of those same shops in other parts of town. Still, after Rodeo Drive, Abbot Kinney is the most talked-about, most Instagrammed shopping street in all of Los Angeles. And locals can be heard telling tourists they must go to Abbot Kinney, repeating the name over and over to be sure they don't forget. What is there to do if you decide to go? The main activities can be summed up in a few words: Shop. Walk. Eat. Drink. Relax. You can see it all. The street is short. It would take you no more than 15 minutes to walk from one end to the other if you didn't stop. Instead of falling victim to analysis paralysis before you go or getting stuck standing on the sidewalk with that deer in the headlights look, just go into every shop and let yourself be surprised. If you prefer to have a plan of action when you go, you can find a list of businesses on the Abbot Kinney Blvd website. You should also know in advance that Abbot Kinney is not the place to shop for cheap souvenirs, t-shirts, and sunglasses. For that, go a few blocks north to the Venice Beach Boardwalk. You'll find plenty of coffee shops to fuel your random walk. If you look hard enough, you might even discover a matcha cafe or a pop-up coffee truck randomly parked at a curb. You can also find lots of restaurants along the street, spanning a broad range of cuisines. It's a fact of life that yesterday's top-rated hot spot can fall from favor in a flash. Before you head off to the place you read about last month or the one your friends at home say is a must-do, check their current ratings. Also, make reservations at the top spots as far ahead as possible to make sure you snag a seat. If you're a tourist, you should definitely venture away from Abbot Kinney to see a few iconic Venice Beach spots while you're in the area. Walk west from Abbot Kinney on Venice Boulevard for about 15 minutes, and you'll get to the beach and the Venice Beach Boardwalk. After you're done watching the street performers there, buying your souvenirs and taking in the scene, detour from Venice Blvd onto Grand Canal or Dell Avenue to walk among the Venice canals. Venice Beach is also the headquarters of Google in southern California. Their building's pedigree is impressive, created for an advertising firm by architect Frank Gehry with a unique binocular-shaped entrance designed by artists Claes Oldenburg and Coosje van Bruggen on its street-facing facade. It's at 340 Main Street, which is a few blocks north of Abbot Kinney. Also nearby is Rose Avenue, where you can find local shops, some places to eat — and maybe even a parking spot — in a less-hyped atmosphere. And don't miss the Instagram-worthy giant clown above the entrance to the CVS store at the intersection of Rose Avenue and Main Street. The first Friday of every month is food truck night. You can get a roundup of who will be there on the Abbot Kinney Blvd blog. The annual Abbot Kinney Festival is held on the last Sunday of September. Just because Venice is near the beach doesn't mean it forgets holiday traditions. In a very SoCal kind of a way, the street's holiday stroll includes a fake snowfall. The busy part of Abbot Kinney Boulevard is a mere half mile long. It runs between Venice Boulevard and Main Street, but the shopping area ends at Westminster Ave.
You can easily get there by driving, but using a ridesharing service like Uber or Lyft may be the best way to go so you don't have to worry about parking. If you decide to drive yourself and need a specific location for your GPS, use 1357 Abbot Kinney Boulevard which is approximately in the middle of the shopping area. There are no parking meters on Abbot Kinney, but there are time limits. On weekday mornings, it's easy to find an open space there. To avoid a costly parking ticket, watch out for No Parking signs designating two-hour periods that are set aside for street cleaning and are diligently enforced. If you get there in the evening and on weekends, parking is trickier. If you cruise up and down the street a few times and your prayers for a miracle parking spot are still unanswered, try for metered parking along Irving Tabor Court which runs north of and parallel to Abbot Kinney between Venice Boulevard and Santa Clara Ave.
You could also head for the neighborhoods and hope your lucky underwear is doing its job, but the chances of seeing a monkey riding an ostrich down the street are higher than actually finding street parking there. Your next best bet is valet parking which is available evenings and weekends for a fee. You can find valet locations along the Boulevard and on Electric Avenue. Some businesses validate for the valet service. Or try the leap-frog valet which lets you drop off in one place and pick up at another.